Miss White Rock 2016-17 Emily McTavish (second from left) celebrates with fellow White Rock Youth Ambassadors Sunday at the White Rock Sea Festival. White Rock Sea Festival celebrates 67th year with a weekend of activities. Thousands of people packed the waterfront over the weekend for the 67th annual White Rock Sea Festival. A torchlight parade, fireworks show and musical entertainment were all part of the fun, which drew an estimated 100,000 people to the beach, according to organizers. Sunday’s main event was the torchlight parade. Crowds lined Marine Drive to watch 60 entries head down the strip, including White Rock’s own colourfully-lit festival float and the Hyack Festival’s craft, which won top prize. At East Beach, Pirates in the Park sailed into Semiahmoo Park, offering a host of creative kids’ activities and entertainment, including a visit from Disney princess Ariel. 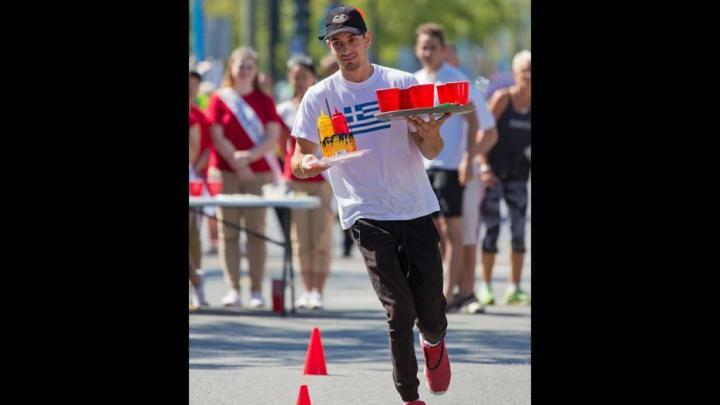 The festival’s annual waiters’ race drew a host of willing servers to the strip. Staff at Uli’s Restaurant emerged victorious, winning the coveted Souper Bowl trophy for their agility. Friday’s highlight was the fireworks show. “It was packed down there. You could look down the pier from the white rock and see people lined up all down the pier waiting for the fireworks to start,” said LaMarre. As a prelude to the festival on Friday, the White Rock Youth Ambassadors’ Gala crowned Emily McTavish as Miss White Rock 2016-2017. Organized by the White Rock Events Society’s five-member board and its 100 volunteers, the festival also boasted a car show, oceanfront yoga, vendors’ marketplace, a lantern walk on the pier and a host of local musical acts – headlined by Tom Lavin and the Legendary Powder Blues. “If it wasn’t for our volunteers, we wouldn’t move forward at all,” LaMarre said. “They’re absolutely phenomenal.